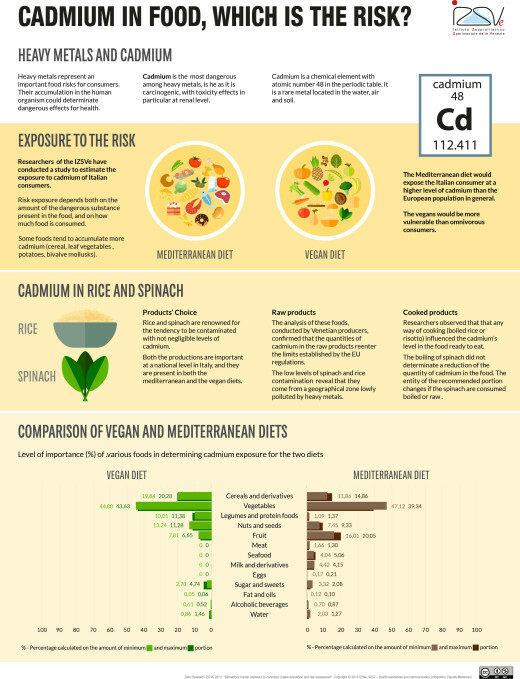 Exposure to cadmium: which risk for the mediterranean and the vegan diet? Home > News > Research & Projects > Exposure to cadmium: which risk for the mediterranean and the vegan diet? Heavy metals can accumulate in food and thus damage human health. Cadmium is the most dangerous among heavy metals, as it is carcinogenic, with toxicity effects in particular at renal level. Heavy metals represent one of the most important food risks for consumers. They belong to the category of the chemical risks and their accumulation in the human organism could determinate dangerous effects for one’s health in the long term. Cadmium is the most dangerous among heavy metals, as it is carcinogenic, with toxicity effects in particular at renal level, and for this reason, it is continuously monitored in the foods that more can transmit this risk. 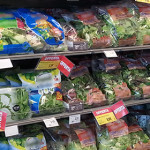 Researchers of the Istituto Zooprofilattico Sperimentale delle Venezie (IZSVe) have conducted a study (RC20/11) to estimate the exposure to cadmium of Italian consumers who follow two principal dietary regimes: the Mediterranean and the vegan diets. Results have then been compared with the maximum safe intake level fixed by the European Union. The comparison with the European data has showed that the Mediterranean diet would expose the Italian consumer at a higher level of cadmium than the European population in general, while the vegans would be more vulnerable than omnivorous consumers. 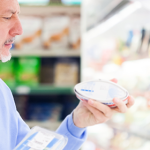 The conditional is required because the model of exposition to risk developed by the researchers referred to diets responding to international guidelines, although researchers tried to make them as much similar to the ones usually adopted by Italian consumers. 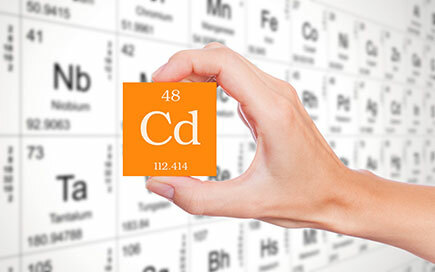 The risk exposure to cadmium is dependent on two factors: 1) the amount of cadmium accumalted in the specific foods consumed; 2) the quantity of the foods consumed. These considerations must then be assessed in accordance with the capacities of physiological absorption of each individual. 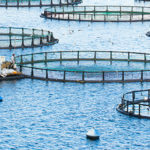 Cadmium is an environmental contaminant: it is in the air, in the water and in the soil, and as such, it could accumulate itself in animals and plants, that than reach our tables. 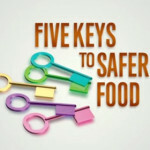 Therefore, the presence of this heavy metal represents a problem for food safety, related to both the type and the quantity of food people eat. In fact, although some foods are more dangerous than others are, as they tend to accumulate more cadmium (cereal, leaf vegetables , potatoes, bivalve mollusks), it is also true that the quantity of product consumed has an impact in the consumer’s exposure to that risk. Risk exposure depends both on the amount of the dangerous substance present in the food, and on how much food is consumed. In others words, if a food is hardly ever consumed, the contribute of that food to risk exposure might be negligible although it has a large amount of cadmium. At the same time, risk exposure increases when a food that is just a little bit contaminated, is consumed in massive quantities. These considerations should be read according to one’s dietary styles and the physiological detoxification process which may differ from person to person. 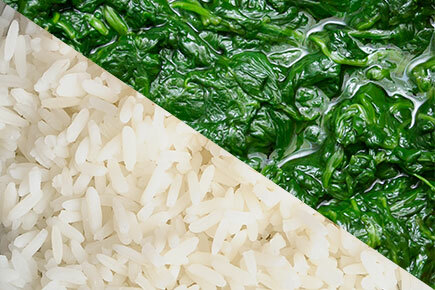 The analysis explored the contribute at the exposition of two foods in particular, both renowned for the tendency to be contaminated with not negligible levels of cadmium, and whose consume hasn’t to be considered negligible: the spinach, representing leaf vegetables and the rice. Both the productions are important at a national level (for sure the rice is a leading product in the Veneto Region), and for sure they are present in both the Mediterranean and the vegan diets. A IZSVe research explored the contribution to the exposure to the risk provided by two foods in particular: spinach and rice. 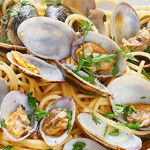 Analysis of these foods sampled from North East Italy producers have confirmed that the amount of cadmium in the raw product in this region are within the limits set by EU regulations. 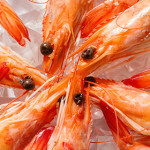 The analysis of these foods, conducted by Venetian producers, confirmed that the quantities of cadmium in the raw products reenter the limits established by the EU regulations. The low levels of spinach and rice contamination (including brown rice) reveal that they come from a geographical zone lowly polluted by heavy metals. Specific analytical methods based on Atomic Absorption Spectrometry have been developed for cadmium detection. One of the most interesting aspects taken into consideration by the researchers was the action of cooking, in order to detect eventual variations in the level of cadmium. As far as concerns the rice – to be consumed cooked – researchers observed that that any way of cooking (boiled rice or risotto) influenced the cadmium’s level in the food ready to eat. The boiling of spinach did not determinate a reduction of the quantity of cadmium in the food as well. In this case the entity of the recommended portion changes if the spinach are consumed boiled or raw (ideal portion is equivalent to 200 gr in case of cooked and equivalent to 80 gr in case of raw food). Consequently, the way the consumer prefers to eat food influence his exposure to risk. 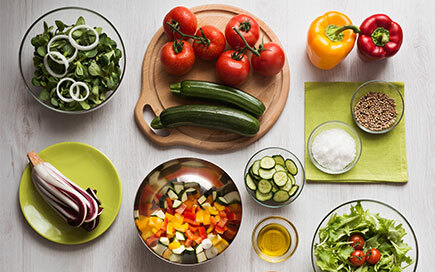 The IZSVe research also estimated the level of risk of cadmium exposure of Italian consumers who follow two main diets: the Mediterranean diet and the vegan diet. The proposed model allowed the researchers to highlight that vegans would be more vulnerable than omnivorous consumers. The analysis allowed the definition of a model to estimate the adult consumer’s weekly exposure to the cadmium. Results seem to suggest that the vegan consumer is theoretically exposed to a higher level of cadmium. It is worth noticing that the availability of tools that can help to estimate how much and how people are exposed to risk is of great concern for public health. 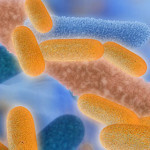 These tools might determinate how much food is consumed and then calculate the probability of accumulate cadmium in the organism; otherwise, it would be enough to define how much that food is avoided from one’s diet as it is considered contaminated. These tools can be used to assess the individual’s exposure to risk. If there should be the need to analyse the risk exposure of a group or a category of people, mathematical models should be adopted. To work efficiently, these models need at first data entry to set up the model itself and then need to be tested. The model proposed in this study estimates the level of exposure using data about the amount of cadmium that is present in the foods that characterize the two diets. Data refer to food produced and/or sold in the national territory. The data referring to the personal intake as used in the models refer to an “ideal” diet, in which the number of weekly portions (minimum and maximum) and the quantity of food for portion are established by specific guidelines (e.g. the “food pyramid” for the Mediterranean modern diet, III international conference CIISCAM, Parma 2009; the “pyramid for vegetarians”, modified for vegans, Venti e Johnston 2002; LARN 2013). It is not a question of real food consumption but at best of what it should be eaten by who follows a Mediterranean or a vegan diet. In addition, the choice of which foods characterize the diet, namely the preference for a food compared to others in the same macro-category (e.g. vegetables), bases on data from a national survey on food consumption commissioned by the National Institute of research for food and nourishment (INRAN-SCAI 2005-06) regarding the Mediterranean diet, and on data of an earlier research (RF/2010) for the vegan diet. The portion attributed to each food was set at the value indicated by the official guidelines in the case of exclusive consume of that food, inside the category considered; obviously, if the meal expects the consumption of both spinach and other vegetables, the portions will presumably be reduced. The way the data on the consumption has been defined is important for the coherence of the model at the reality. The use of no robust data , or not consistent with the reality, could lead to an overestimation that should be adjusted with detailed data on the food consumption of the real population. The proposed model permitted to emphasize the higher exposure to cadmium for the vegan consumers . So, the guidelines for an healthy eating should be based not only on the nutritional values, but also on a “risk-benefit” approach in which also chemicals risks should be appropriately considered.